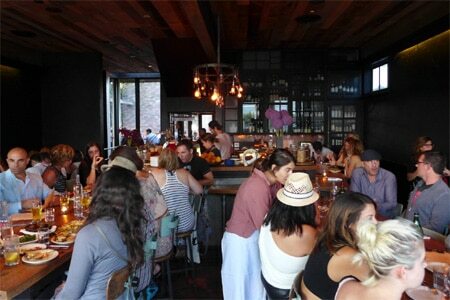 : Primetime reservations fill up quickly at Gjelina on fashionable and artistic Abbot Kinney Boulevard in Venice. (The restaurant is named after owner Fran Camaj's mother.) There is no exterior signage, so look for a wood façade. Upon entering you’ll discover two huge communal tables in the center, a large bar in the back and tables along the walls. The noise level can be quite high, so don’t expect to have a quiet meal. We recommend the outdoor patio where the fire pit, eclectic furniture, white tiles and a view into the kitchen give the space a luxurious, bohemian twist and a homey feel. A few tables are tucked away in a semi-private space lit by a wine bottle chandelier. Chef Travis Lett has fun with seasonal produce, and has composed a menu of rustic delights. (The menu points out that changes and modifications are verboten here.) Kick things off with fresh oysters, wood-roasted cauliflower or a Tuscan kale salad with shaved fennel, radish, lemon and ricotta salata. Continue with larger plates like grilled Aspen Ridge “bistro” steak with chimichurri and medium-cut fries. The wood-fired oven turns out light and crispy pizzas with toppings like mixed mushrooms, rosemary and garlic oil, and lamb sausage, confit tomato, rapini, Pecorino and Asiago. Finish with the ever-popular butterscotch pot de crème with salted caramel. 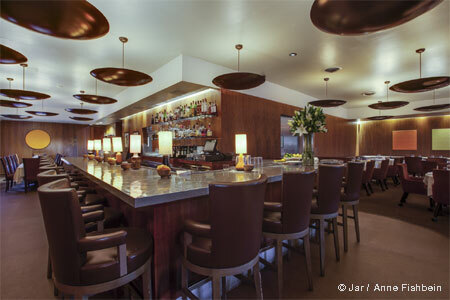 The short wine list favors French selections and also includes options from other European countries and California. About two dozen offerings are available by the glass. There are also four local beers on tap plus a few bottled Belgian ales. Service is usually efficient.